We're a vibrant and friendly community located in Vermont's Green Mountains. 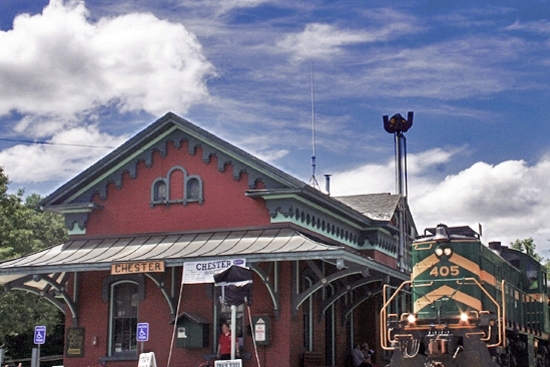 Located in the scenic Green Mountains, Chester, Vermont is a thriving town with a strong sense of history and place. Easily accessible from I-91, we are a picturesque, engaged community providing a wide range of four-season activities making for a uniquely rich quality of life for our residents and visitors alike. Chester's Stone Village Historic District and its sweet main street and green claim spots on National Register of Historical Places. New England Travel Today recently named Chester one of the ten best antique towns in all of New England. Enjoying the outdoors comes second nature to us; we're active in our own backyards and we take advantage of our proximity to Bromley, Stratton, Magic Mountain, Mount Snow, Okemo Mountain Resort, and Killington. Lately, the buzz has revolved around our blazing fast, reasonably-priced internet speed. Lucky us, we're at the center of one of the U.S.'s fastest fiber optic cable networks in the United States making us one of the best connected communities in the nation. Whether you're visiting Chester, Vermont for the weekend or considering a move here, we're happy to show you around and give you a taste of what makes being here so special. handy guides for visitors and residents alike. There's no shortage of things to see and passions to pursue in Chester, Vermont. Our local park, The Pinnacle, is a nexus of much of the town's outdoor activity; while our beautiful green at the center of the village serves as a focal point for several annual community traditions and festivals.